A must-have collector's deck, our Bicycle Civil War Deck was designed and hand-illustrated by Jackson Robinson as part of the Kings Wild Project. 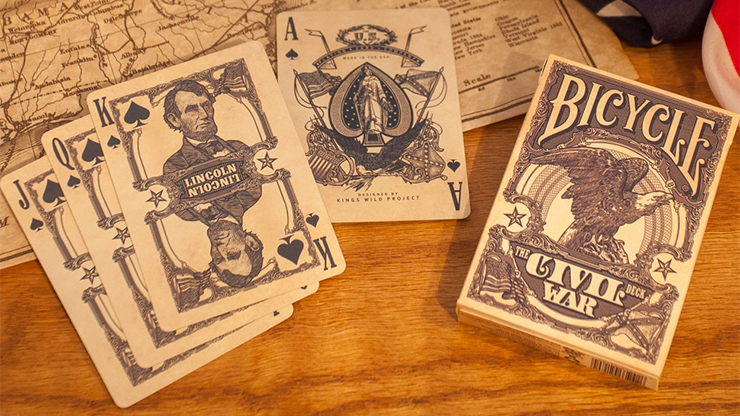 The Bicycle Civil War Deck is chock-full of characters, icons, and imagery from America's Civil War. The court cards, card backs, and details are all rendered in the same engraved style as Jackson's popular Federal 52 Deck. Featuring players like Ulysses S. Grant, Robert E. Lee, Harriet Tubman, and more, this deck will make a historic addition to your collection! Bicycle® brand decks are made in the USA and feature the patented Air-Cushion™ finish and softly beveled edges for enhanced game play.